Intuit QuickBooks is a completely cloud-based business management platform that allows you to manage your accounts quickly, easily and collaboratively. However, most small businesses, start-ups and individuals have little budget to spend on a platform to manage finances. Thankfully, the amazing developers at Wave Apps have released an almost equivalent platform free of charge. With mobile in mind, the Accounting software from Wave allows you to manage businesses of any scale from a browser. 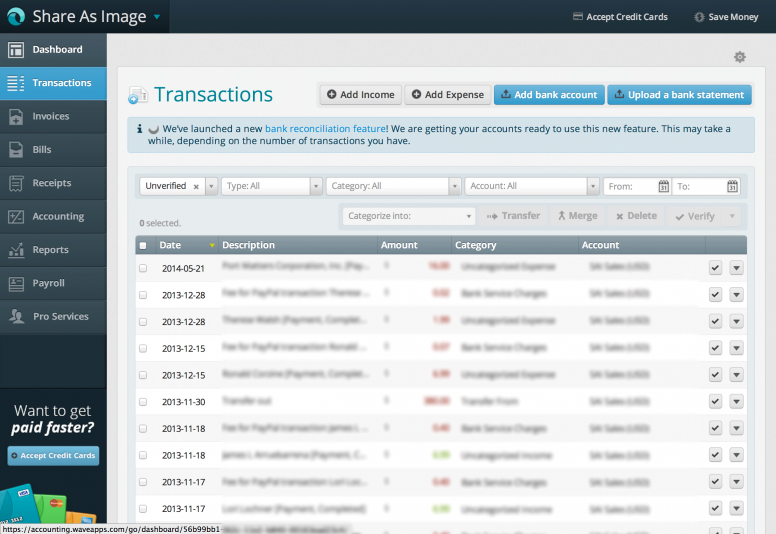 You can create invoices, take payments and conduct your payroll quickly and easily. My favourite features of this platform is the fact that it is completely free (they only collect affiliate commission if you hire one of their ‘recommended’ accounting services – which are never forced upon you). Furthermore, there is fantastic integration and compatibility with many chosen platforms. For example, you can automatically sync your bank account transactions as long as you have an online banking account. Currently, this service is already compatible with an incredible 10,000 service providers. During my test on the platform, I found it very easy to sync customers from Google Contacts and bill them for expenses. Wave Apps’ software deal with emailing a digital invoice to your customer where they can choose to pay online using their card via Stripe. You can set a due-date for the invoice, and if the invoice remains unpaid the Wave Apps platform automatically sends reminders to your customers. Unlike many other paid options, Wave Apps doesn’t force you to take payments online. You can choose to disable the option of taking payments online and instead deal with Cash and Bank Wiring. Since your Wave Apps account can be synchronised to your Bank Account – it will automatically recognise incoming payments as invoice balances! This is a key feature for growing businesses that want to avoid accounting and finance staff costs – the app does many of the small tasks for you!